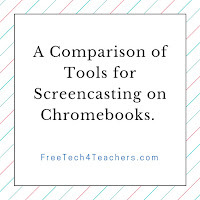 In response to my latest Practical Ed Tech Tip of the Week I received a bunch of requests for comparisons of screencasting tools that work on Chromebooks. So yesterday I made three screencast videos using three different screencasting tools. 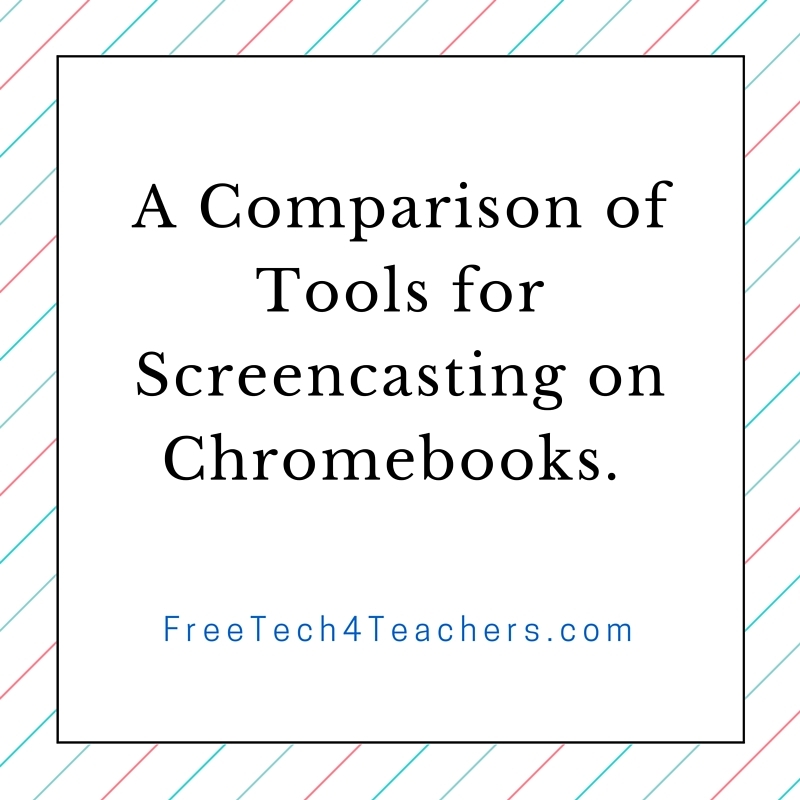 Add that to the one that I made on Friday with another screencast tool and you have four options for creating screencasts on a Chromebook. The four options are Nimbus Screenshot, TechSmith Snagit, CaptureCast, and Screencastify. My comments on each are listed below. The list is ranked according to my preference. Nimbus Screenshot is my favorite tool on this list because of its ease of installation and it is the only tool on this list that provided a customizable countdown timer. I like the countdown timer because it gives me a few seconds to prepare to start talking over my screencast. The other tools just started recording the second that I hit the record button. Nimbus Screenshot was also the easiest to install and configure on my Chromebook. Screencasts recorded with Nimbus Screenshot can be saved to your local drive or to an online Nimbus account. I chose to save to my local drive then upload to my YouTube channel. You could also save to your local drive then share to Google Drive or another online storage service. Take a look at the video I created with Nimbus Screenshot. TechSmith's Snagit tool is a close second to Nimbus Screenshot. The only reason that I ranked it slightly lower is that it takes a bit of reading to understand how all of the features work, but that is to be expected when a tool has lots of options. The advantage of Snagit is that you can save your recordings directly to your Google Drive account or YouTube account. Snagit also benefits from being backed by TechSmith who is arguably the leader in screencasting tool development. From a recording standpoint, I wish that Snagit would include a countdown timer before I started to record. Check out my screencast made with Snagit for Chrome. CaptureCast is the tool that I featured in a post last week. I put it on the same level as Snagit. CaptureCast was rather easy to install. Your recording length is unlimited. You can record your webcam while recording your screen which you cannot do with the Nimbus tool or Snagit. Set-up of CaptureCast is easy too. For folks who don't want to use YouTube to share recordings, CaptureCast lets you share directly to a Vimeo account. See my CaptureCast sample in this post. Screencastify might have the most name recognition in this list, but I like it the least of the four tools in this list. In fact, it's definitely the last one that I'd recommend to new Chromebook users. The set-up process asks a lot questions that could confuse new users. The free version limits recordings to ten minutes and puts a watermark on the recording. I was also not impressed with quality of the video recording. See my Screencastify sample to see the watermark and recording quality. Come to the Practical Ed Tech Chromebook Camp to take a deep dive into creating videos on Chromebooks. Discounted registration is available through the end of the month.